The Spear-Bearing Sky-Raiser is the higher one of the Two Sky-Raisers (as-simakan), and for this reason it was sometimes called the Watcher. The Spear-Bearing Sky-Raiser is so named because it has a bright star close to it that is said to be the Spear (ar-rumh) that it has thrown. The alternate name for this star, the Banner of the Sky-Raiser, was also common and recalled the military standard used in battle. 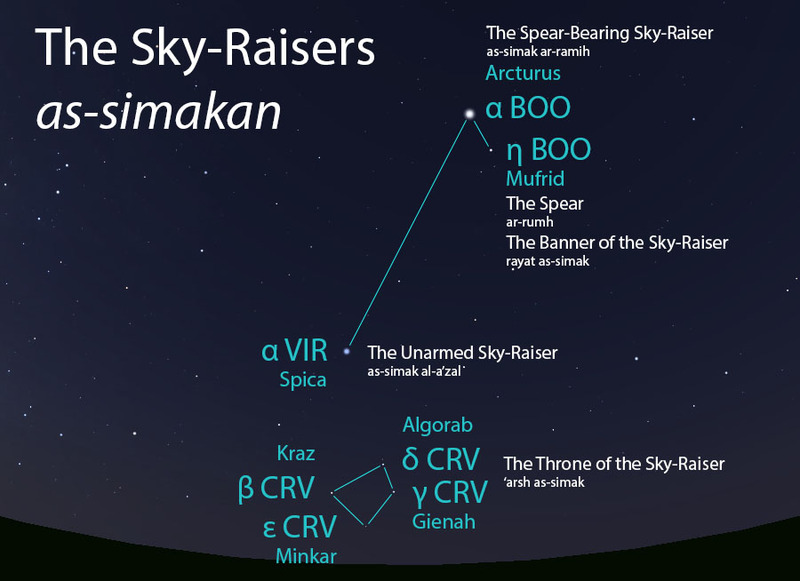 The lower, Unarmed Sky-Raiser is called “unarmed” because it does not have a bright star close to it like the Spear-Bearing Sky-Raiser does, but it does have a Throne (‘arsh as-simak). 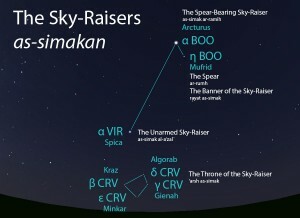 Wide-field view of the Sky-Raisers (as-simakan) and their elements as they appear when its Throne (al-‘arsh) is setting in mid-March. Sky simulations made with Stellarium. A pair of very bright stars that are spaced widely apart. The northern star has a moderately-bright star located close to it. The southern star has near it a grouping of four moderately bright stars that is arranged in a quadrilateral shape. The Two Sky-Raisers set about 40 days apart but rise within a week of each other. Ibn Qutayba (d. 879 CE) reported that the Unarmed Sky-Raiser (the first of the pair to set and the second to rise) was said to rise on the morning of October 6 and set on the morning of April 5. On account of the precession of the equinoxes, today we can expect to observe the Two Sky-Raisers and the Throne setting from mid-April through early June, and rising in mid to late October, as seen from the latitude of Tucson.